Fred Rogers, who played the mostly auto-biographical character of Mister Rogers on the 900+ episodes of Mister Rogers Neighborhood that aired from 1968-2001, has seen quite the revival as of late. Award winning Won’t You Be My Neighbor and Mister Rogers & Me are recent documentaries highlighting the life and times of this once in a generation figure. After seeing the trailer for the former, I impatiently waited for months for it to come to the theatre. When I finally watched the film opening night, my eyes were wet and my heart was full. Mister Rogers is unlike the television characters I remember watching as a child and also exist today. Instead of a world and characters revolving around a main protagonist, Mister Rogers highlighted the importance and value of the viewer on his show. Mister Rogers wanted you to know that his world revolved around you. He did this through something he called individuation. A term I first read in Amy Hollingsworth book The Simple Faith of Mister Rogers. 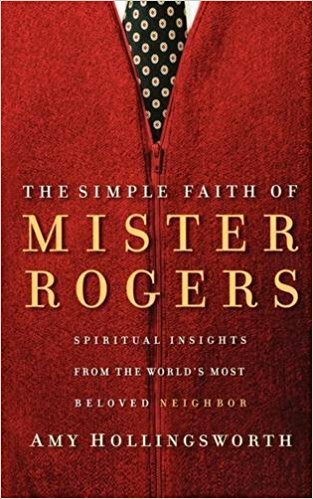 This book should be immediately added to anyone’s list who is interested in the life and works of Rogers. Hollingsworth’s book is a fantastic read and provides a rare and powerful glimpse into the Christian walk. Rogers love for God and others are on full display as Amy recounts the stories of his loving devotion and desire to develop the character and relate to the emotions of his young viewers. Anyone who has followed my writings knows, I have a deep desire to help others discover and benefit from knowing the true value of who and why God made them the way they are. While Mister Rogers Neighborhood was not a Christian show, the heart of believer Fred Rogers and the principles of God’s word were woven into every episode like the cotton threads of his iconic red sweater. Individuation as described by Hollingsworth is, “a lifelong process of integrating influences and instincts that make a person whole, a discovery of his or her uniqueness. It also carries with it the idea that we become who we were intended to be, by design, not just who we think we should be.” Fred was able to cut through the scientific textbook definition of the term individuation and its definition in a more simply way when he said, “You are special just the way you are.” That phrase is now synonymous with the Mister Rogers show, but it also defined Fred Rogers personal ministry here on Earth. God has made you special. Jesus knew it. Fred Rogers knew it. Both wanted you to know it. I hope to carry a little torch of this same message everywhere I go from now on as well. My latest book, God Has a Sentence for Your Life, will offer a simple to understand observation that God has made you special for a purpose. I hope to guide those searching to realize their uniqueness and purpose to find Christ who is the true revealer of these mysteries. While I remember watching some episodes of Mister Roger’s Neighborhood as a child, I don’t remember much, if any, impact it had on my life because I enjoyed other programs more. Since the resurgence of Mister Rogers in film and books recently, I have now been able to notice and understand the true value and impact that his show and life had on the world and individuals. I also noticed, mostly because of my own faith in Christ, that of all the lessons and insights of Mister Rogers, the best lesson he taught us was a simple and real-life example of what Christ says is one of the greatest commandments. He asked and sometimes sang the question to us on his show all the time, now it’s our turn to continue the legacy of Mister Rogers and begin to ask others. “Won’t you be my neighbor?” I’ll leave the choice to sing up to you.